Tag line: "It IS a laughing matter!" What exactly is the “Lubitsch Touch”? Well, to answer that question, we have to know a little something about the man who inspired the phrase, director Ernst Lubitsch. Starting out as an actor and sometimes-director in his native Germany, Lubitsch emigrated to Hollywood in 1922, where, for the next 25 years, he turned out a number of classic films, including Trouble in Paradise, Ninotchka, To Be or Not To Be and The Shop Around the Corner, each a comedy of manners that featured intelligent, often upper-class characters and lots of clever dialogue. 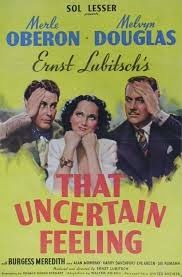 Many of these same traits can be found in Lubitsch’s That Uncertain Feeling, a movie about a husband and wife who, despite their feelings for each other, decide to get a divorce. While waiting to see her therapist, housewife Jill Baker (Merle Oberon) meets a disgruntled pianist named Alexander Sebastian (Burgess Meredith), and the two immediately hit it off. Having grown bored of her marriage to insurance salesman Larry (Melvyn Douglas), Jill enters into an extra-marital affair with Sebastian, which grows more serious with each passing day. Larry does eventually learn of his wife’s infidelities, but far from being angry about it, he approaches the situation with a level head, and agrees to grant Jill a divorce. But is that really what she wants? Like many of Lubitsch’s films, That Uncertain Feeling has plenty of snappy dialogue. While complaining about her husband to her good friend Margie (Olive Blakeney), Jill tells the story of how, after struggling to fall asleep one night, she was awakened at 8:15 a.m. by her husband’s “gargling”. “That’s the bugle call of marriage”, Margie sympathetically replies. “Gargle is reveille and snore is taps”. The cast is also good. Oberon and Douglas generate sparks as the “unhappy” couple, but it’s Burgess Meredith as the hilariously glum and far-too-honest Sebastian that steals the show. The first time he meets Jill, Sebastian tells her, in no uncertain terms, that he says what he thinks, adding “I’m against Communism, Capitalism, Fascism and Nazism. I’m against everyone and everything”. He maintains this gruff exterior through much of the film (The scene where he’s leading Jill through an art gallery, sharply criticizing the various works on display, is a high point). Having grown up watching Meredith as both the Penguin in the ‘60s Batman TV show and as the cantankerous trainer, Mickey, in the Rocky series, it was fun to see him portray such a different character. While it never achieved the same notoriety as some of his other works, That Uncertain Feeling is, in every way, an Ernst Lubitsch production, and that alone makes it a movie I would gladly recommend to everyone.